Pasa el ratón sobre la imagen para ampliarla. Puntuación: #TOTAL_SCORE# de 5, basado en #TOTAL_NUMBER# reseñas. Easy to use, no drivers need to install ! Amazing interface ! Amazing product. Couldn’t believe how fast it shipped. Would consider buying again! I bought it refurbished and it works just as well. Happy with the performance and portability. Would recommend to anyone who wants the simplicity of the product and the power of a professional studio. It's the 2nd time I bought it. Its exelent! Thank you Focusrite for doing so good and simple device for such a low price. And software what comea with is great too. Bought this to record an electric guitar. Set up was easy, quality good. Chose the Scarlett for its low latency. Although my CPU is not strong enough to record in 96khz, I could still bring down the latency to around 4ms roundtrip, which is less than half than what my previous sound card could do. So far no problems with drivers or hardware. Just got my (refurbished) scarlet Solo. Sounds great, looks new, arrived fast!!! Very simple to use. Quality of the sound of the guitar I put through is great. This product is exactly what i needed! The cable color should match the color of the main product. Buen producto, perfecto para mi uso en el homestudio. Clean Preamp, low latency. Great! My Scarlett Solo 2nd Gen arrived three days after I ordered it and I've been using it ever since. Excellent product for a fraction of the price of other audio interfaces. Sound quality is great, I don't hear pops or audio dropouts when working in my DAW(Reaper). Overall a great product! I'm so happy to buy this item, it's one of the best audio interfaces in the world. Scarlett Solo is definitely small and compact but do not be fooled by its size as it is in level with its higher end brothers! Direct monitoring gives zero latency as promised! Line output on the back to connect to your speakers. Also, it is most suitable for those starting a home studio, or only need two channels input like for vocals and guitar at the same time. Very satisfied with this item! I purchased the kit for someone else so I can't comment personally, but they tell me it has really added professional quality to their sound recordings. Good piece of equipment, works well. Compact and simple but very good product and quality, recomended for home studio recordings. Solid build. Smooth knobs. Simple interfance. Suits my needs. Easy to use. So far the Scarlette Solo 2nd Gen has been great! It’s got some good features including green/red lights around the gain to tell if it’s too loud, phantom power for mics, and a direct monitor so you can hear what you sound like through speakers. The sound is soooo clear and crisp, it is beautiful. Also, what made this purchase doubly great was all the music software (Ableton Live Lite and assorted plug ins) that come with it! I am really liking that software bundle. I purchased refurbished, so lower price, but still amazing quality so far and I still was able to get all the software that you would get with a new model. Since the product shipped from England, it took a while to get here (maybe a couple of weeks). A few things I’m not as a fan of are: the output to monitors is a direct line with two outputs (right/left) that works with a stereo system but would need an adapter to plug into a sound system; the headphone jack is a quarter inch so I would need to buy an adapter for any of my eighth inch headphones that I currently own; and lastly, it would be amazing if there was a simple mute button for each of the channels since to unplug you have to turn down the monitors completely so as to avoid the loud popping sound that comes with unplugging. This last one is an inconvenience if you are running your sound through the Scarlette, because you have to turn down everything to avoid the popping sound. Overall, a great product that I would recommend. Solidly built and does exactly what it advertises. Unless I can make it work on Acid pro it's no use to me. Easy and Fast and what I wanted. Superó mis expectativas ampliamente, el envío fue super rápido y el producto es de primera, gracias! The best budget audio interface for a home studio. Works great with both mic and instruments. Sturdy metal casing makes it a premium buy. I would like to say big THANK YOU to the Focusrite and their service. The sound of my new Scarlet Solo 2nd Gen. is sooooo clear and deep. Delivery to Ukraine was taken 4 working days and that was faster than I thought. The Scarlett Solo delivers quality performance in a small package and was perfect for my needs! I had seen the Scarlett Solo in use on Youtube quite a bit. Without prior experience in recording I trusted some review videos and reviews. The Scarlett works just as promised. It set me up for an easy start into recording my music. Definitely a good choice. I should have purchased you a long time ago baby. Exactly what I wanted. Quality construction. Ease of use. This is exactly what I was waiting to get, and its worth it. I bought a recon unit for under $100. To get this quality 192/24 unit for that price is outstanding. This is an amazing audio interface for the price and a very high quality one too!! I strongly recommend one at this price! Great device for streamlining your process for vocals or guitar tracking. Works flawlessly and is easily installed. I do a lot of DI tracking and being able to use this directly to my laptop is incredibly useful to pick up and go. A great value for the price. I bought this to have a portable interface and this thing just works. No issues with it. I recommend Focusrite if you want a no-headache experience with professional-quality products at a fair price! Awesome! Up and running very quickly with little experience. Would highly recommend to anyone getting started. Great product. Easy setup and installation on Windows 10. No issues so far. Great, very easy to use, no-fuss audio interface. Works as expected. Comes with great instructions for set-up and optional video tutorials for every step in case you need them. Very pleased with this tidy little red box. Does what it says on the tin. Great piece of kit. Lovely little pre amp and great bundle of software to go with it. Really good for the price. Great bang for buck, so far no problems installing and getting it to work on Win10 with several editing programs. Solid unit great sound quality and reliable software. I love to record everywhere, and Scarlet Solo 2nd gen its perfect for keep recording on a trip. Excellent interface!! Works perfectly , no latency. Low latency, perfect ASIO driver and elegant and sturdy construction. Finaly I found what I needed. This product was extremely easy to use once I set it up. If you can read the inputs/outputs, its fairly self-explanatory. Sounds great! Easy to use! Easy to set up, exceptional audio quality, and looks the part! 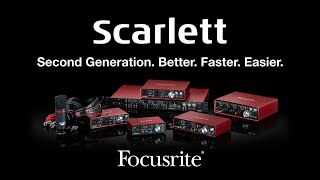 Focusrite Scarlett - Clean, warm and complimentary. I record a lot of acoustic instruments, and needed a new portable interface I could use away from my small home studio. I have wanted to experiment with recording in other acoustic spaces, and so began my search for a small buss powered interface, One that I could just connect to my mac and record. I spent a lot of time on-line researching, and was for a time very tempted to go with another interface that boasted burr brown converters and class A preamps. Many reviewers of that product talked about the the red boxes having a thin and harsh sound. So much for reviews, this Focusrite Solo is clean, full, warm and natural. A visit to the Focusrite site and the great examples they give under "Products>Mic Pre Masters" menu helped me center my thinking and realize, the reviews of the Scarlett were skewed. Now after one week of ownership, and as a result of my experience with the Scarlett Solo during that week, I realize its time to retire my MOTU Traveler. In fact, I am now using the Solo for mixing in my studio until, I have the funds to get another, and larger RED box. In the meantime I will just put up with the limited number of ins and outs for the sake of quality of sound. My final reason for choosing Focusrite comes down to personal experience with other Focusrite products. I have owned a Focusrite ISA one for about five years and this has and continues to be my go-to preamp for anything acoustic, including vocals. Also, my first ever USB interface was the original MBox which featured Focusrite preamps that also sounded great, certainly better than the grainier sound of my then Digi 02 preamps. Maybe I sound like a Focusrite snob, but no, if I want ultra transparency then I turn to Grace, and while the Solo preamp does not have the same level of depth as the Grace 101, it adds no hyped color to the sound, rather, it reflects what it hears, with clarity and without harshness, . One final thought, the Focusrite Red 2 EQ, and Red 3 Compressor plugins included with the interface, make the cost of the Scarlett Solo worth every penny. Focusrite's on-going customer support and their plugin collective program, clearly shows they want to help customers grow. In summary, I like the Focusrite customer facing attitude, and the no fuss quality of their products. As long as they maintain these long lasting and very high standards, I will be a customer. The product was exactly what I as expecting, nothing more, nothing less. I was over all very pleased. Still messing around with it and hope to continue to discover more about the product. Perfect condition and works right from the get go. No complaints. Exactly as described. Really easy to setup and sound quality is better than the opposition. Qua ity ! Seems great to me. I use it with a new lavalier mic I bought and this pair improved my audio by about 4x. Really pleased, and the Scarlett seems excellent build quality. Scarlett Solo S tiene compatibilidad nativa con Mac. Para PC, se requiere un driver. NUEVA ADICIÓN DE SOFTWARE: Con las interfaces Focusrite viene gratis un instrumento virtual Addictive Keys de XLN Audio. Una licencia completa por cada cuenta permite elegir un instrumento Addictive Keys como Modern Upright, Studio Grand, Electric Grand o Mark One. Además, con las interfaces Focusrite obtienes gratis un instrumento virtual Addictive Keys de XLN Audio. Una licencia completa por cada cuenta permite elegir un instrumento de Addictive Keys como Modern Upright, Studio Grand, Electric Grand o Mark One. Con la interfaz de audio USB Scarlett Solo, tus grabaciones sonarán exactamente como tú quieras que suenen. Conéctala directamente para grabar simultáneamente guitarra y voz en canales independientes y luego poder mezclarlos por separado. Gracias a la nueva latencia superbaja*, podrás interpretar tu música con total confianza y grabar y monitorizar con efectos software en tiempo real. Conecta tus auriculares y altavoces domésticos o monitores de estudio, sube el volumen y sumérgete completamente en el sonido. La gama Scarlett de segunda generación está repleta de mejoras. La nueva latencia superbaja* aportará seguridad a tu interpretación, permitiéndote grabar y monitorizar con efectos de software en tiempo real. El renovado diseño industrial está pensado para que puedas llevarte la interfaz a todas partes, y se ha mejorado con elementos como los nuevos controles de ganancia metálicos y un chasis de metal de color rojo más estilizado. Ahora, las interfaces de la serie Scarlett admiten frecuencias de muestreo de hasta 192 kHz, y los canales de entrada también han evolucionado. El previo de micrófono Scarlett más reciente presenta una estructura de ganancia más equilibrada para que puedas ajustar tus niveles con precisión. La entrada de instrumento también se ha rediseñado completamente, y ahora es capaz de lidiar con guitarras eléctricas con pastillas de señal muy alta. Por último, Focusrite ha incluido circuitería analógica de protección en las entradas y salidas para evitar que la interfaz sufra picos de alimentación no deseados. Scarlett Solo es lo bastante compacto y portátil como para que te lo puedas llevar a todas partes. Ni siquiera te hará falta una fuente de alimentación: la interfaz se conecta y recibe alimentación a través de un único cable USB. Incluye el software y los efectos que necesitas para empezar a grabar: una versión exclusiva de Pro Tools | First Focusrite Creative Pack (con 12 plug-ins adicionales como el emulador de amplificadores de guitarra Eleven Lite), Ableton Live Lite, Softube Time and Tone Bundle, Focusrite Red Plug-In Suite y 2 GB de Loopmasters, entre otras cosas. Un previo de micrófono Scarlett de sonido natural con ganancia equilibrada y abundante. Lo bastante compacto y resistente como para que te lo lleves y lo uses en cualquier lugar.